By Edgefield Advertiser on May 5, 2014 Comments Off on Just Keeps on Packing! The Yonces today running the J. W. Yonce peach business: left to right, Larry, his father J. W. Yonce, Jr., and Sonny. One of several of the busiest men in Johnston, South Carolina took out a few minutes last week to try to educate me in the fundamentals of maintaining a first class agriculture business for more than 80 years over three generations. Sonny Yonce’s grandfather was mainly growing asparagus in the 1930s on what is known as The Ridge along with probably another hundred or so farmers. His peach interest at that time was comprised of a small orchard. Mr. Joseph W. Yonce also found it very helpful to have five sons who he put to work driving trucks into the Washington, D.C. and Baltimore areas loaded with the fruits of his farming effort. Sonny told me that Curley Watson was also employed to travel with his father so that he could get on the back of the truck with a baseball bat as they passed through the various cities to keep people from stealing the produce. In those days the brothers would be dispatched to Charleston to get peat moss and wooden barrels to pack the asparagus in for the trip north. 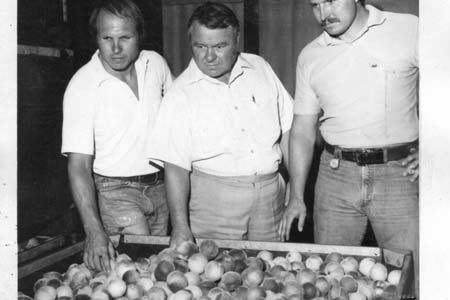 It was during these years that J. W., Buster, Cecil, Walker and Tiny mastered the Yonce code of business that has been the impetus of more than 80 years of prosperity for the farming family. 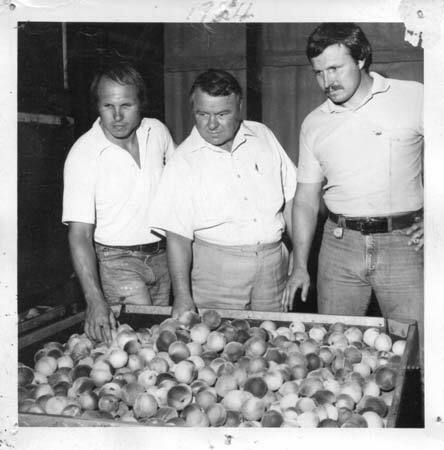 Sonny tells me that it was in the late 40s when farmers started planting peaches in large numbers along The Ridge due in part to a lack of available labor and the influence of the citrus industry. As the orchards grew so did the need for personnel to bring the fruit from the field to what in those days was called the packing shed where it would be loaded on railroad cars for its trip to market. So, as the citrus season waned the personnel would move north into peach country. It was in 1955 that J.W. Yonce built his first packing shed over a sawdust floor. Sonny remembers as a youngster pulling ropes that moved the fruit along the belts for culling and preparing for shipment. The aforementioned railroad cars required large amounts of ice for use in cooling the cargo of peaches. This stimulated the ice production business in the Johnston area where 500-pound blocks of ice would be produced and sent to the packing shed for crushing and placement in the railroad cars. My agribusiness teacher (Sonny Yonce taught and coached football for six years) told me of peaches being loaded all night long during the 50s and 60s. “Yes sir, I remember being one of those lads loading them,” I interjected. It of course would be during these two decades that Johnson led the nation in packing of peaches and thus acquired the name of Peach Capital of the World. Along came the 70s and 80s and with these years there came a slow down in the industry. In 1983 a weather situation not conducive to peach growing wiped out between 50% and 75% of the crop along The Ridge thus allowing California to become the number one producer in the nation. During these decades South Carolina went from some 300 growers down to a handful, four on The Ridge. The question in my mind immediately turned to how has the J.W. Yonce peach business endured. “We owe our longevity to a number of things but the most important is my father and grandfather’s conservative approach to business, if you can’t pay for it don’t buy it. We let our business grow itself,” stated Coach Yonce. Most all of the members of the family are involved in the business and as it turns out there appears to be a hereditary competitive nature in this lineage meaning they absolutely hate to lose, pay attention to details and start each day with more than a few butterflies. Sonny shared a statement he heard spoken by Mr. Heber Satcher years ago the essence of which was that it is impossible to maintain a viable family business for three generations. J. W. Yonce and Sons, Inc. are well into their fourth. Some of the fourth generation were in the office during my visit. It was clear as a bell that they took heed to the third generation, Sonny and Larry Yonce, as they went about learning the business. The changes in this particular industry, as it moves headlong into the 21st century, are remarkable. The days of the migrant crews are gone. The Yonces deal directly with the Consulate in Mexico through the H2A program. Personnel wishing to work for J. W. Yonce and Sons are interviewed in Mexico. If hired they are provided transportation to the work site and upon completion of the task returned to their homes in Mexico. The workers are noted for their work ethic and most repeat the journey to The Ridge over and over. They are trusted employees and often are called on to recommend new employees. The vast majority of the fruit is now transported by truck and the private truck owners that take Yonce peaches to distributors are long term business partners, some as much as 35 years, who are depended on to represent the company in a positive manner. So, when you are growing 4000 plus acres of peaches and shipping 1 million plus boxes of them in a season a hate to lose, attention to detail and a few butterflies seem appropriate. Oh yes, Sonny distinctly remembers decorating his bicycle and riding in The Peach Festival Parades of the 40s and 50s. J. W. Yonce III did not tell me but I suppose Larry followed on his decorated tricycle. Due to weather there will not be many May peaches. Front of June there will be limited numbers with the pace picking up later in the month. Sonny Yonce’s favorite variety of peach is the white-fleshed variety. If you are in Atlanta, New York, Chicago, Detroit, Milwaukee, Cincinnati, and all points in between you can get a Big Smile Peach.